As a Wedding Officiant & Humanist Wedding Celebrant I encourage an atmosphere of relaxation and humor, including only what you want in your wedding ceremony in Half Moon Bay or the San Francisco Bay Area. It’s your special day and should reflect who you are as a couple; you are the focus, not me. Many couples save time and travel by making all arrangements via email and phone discussions. Or I’m happy to make appointments in the Half Moon Bay area for those who prefer to go over the details in person. I bring the kind of experience, maturity, and versatility to your wedding ceremony, making it a warm and unique experience for you and your guests. Two daughters, 2 grandsons and a granddaughter. My Wedding Celebrant fee is based on ceremony location. Most couples save the rehearsal expense by having me not attend a rehearsal; the wedding location staff conducts it or there is no rehearsal. On the ceremony day I lead everyone through each element we decided on previously. A non-refundable deposit of $100.00 holds a date firm. Here Comes The Guide testimonials were collected by interviewing couples. 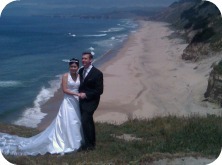 Read our Yelp Reviews at Read our Wedding Officiant Reviews at Wedding Wire. Terry G. Plank, M.Div., performs as a wedding ceremony officiant and Humanist wedding celebrant in the following counties: San Mateo, San Francisco, and South Bay. Peninsula cities include: Half Moon Bay, San Francisco, Palo Alto, Los Gatos, San Jose, San Bruno, Millbrae, Burlingame, San Carlos, Menlo Park, Portola Valley, Redwood City, Woodside, Foster City, Colma, Daly City and Pacifica.